Bangladesh vs West Indies 3rd T20 Highlights: Windies win by 50 runs, clinch series 2-1. Bangladesh vs West Indies 3rd T20 Highlights: West Indies won the third T20I against Bangladesh by 50 runs and clinched the series 2-1. 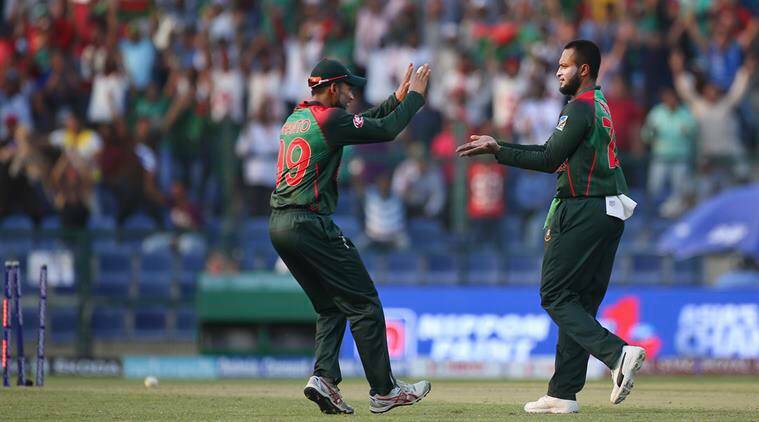 Bangladesh vs West Indies 3rd T20 Highlights: After all said and done, the much-talked incident will go down to be the controversial no ball in the 4th over when Liton Das was caught out in Oshane Thomas’ over. West Indies united after that dismissal and attacked Bangladesh with quick, relentless bowling. The hosts went down from 65/1 in 4.1 overs to 140 all out. Windies won by 50 runs and clinched the series 2-1. Keemo Paul took a fifer to be the hero for the visitors. Earlier, Windies opening batsman Evin Lewis had fired 89 runs in 36 balls to take his side to 190 in 20 overs. WICKET! Carlos Brathwaite gives the final blow - cleans up Mustafizur Rahman. Bangladesh all out for 140. Windies win by 50 runs and win T20I series 2-1. WICKET! Keemo Paul dismisses Mushfiqur Rahim as he pushed at it, on the up and ends up hitting it straight down the backward point's lap. Bangladesh are suddenly 66/4. Liton Das is going to stay!! Liton Das is not going anywhere and he is going to bat. It is going to be a FREE HIT! Brathwaite is discussing that he is not going to accept a free hit. BUT IT HAS BEEN GIVEN A FREE HIT! NO BALL! Liton Das was caught by Carlos Brathwaite but it has been declared yet another no ball by the umpire. Thomas is devasted - Brathwaite is furious. Bangladesh get a free hit! WAIT... the replays showed that it was not a NO BALL. Brathwaite is asking the umpires to change the decision. And the umpire has given it out. The umpires having a discussion whether you can review a no ball call. A six from Tamim Iqbal in the first over and Bangladesh are off to a solid start with the bat in 191-run chase. 10 runs in the first over. Oshane Thomas continues the attack from the other end. Liton Das and Tamim Iqbal are out to open the innings for Bangladesh. Sheldon Cottrell is out to start with the new ball. CHASE IS ON! Fabian Allen goes for 8. Bangladesh are pulling things back right at the end. But that is not at all as Shakib strikes once again in the fifth. Nicholas Pooran smacks a six and a boundary in Shakib Al Hasan's over to take Windies' total over 150 in 13 overs. Pooran and Powell are building a new partnership now. Can they go past 200? A couple from Rovman Powell and Windies bring up their 100 in 7.1 overs. This could become a long chase for Bangladesh. SIX! SIIIIIIIIIIIIXXXXXXXXXXXXXXXX! Evin Lewis ends the powerplay with two consecutive sixes. One of them was struck miles into the stands, it hits the scoreboard. Bangladesh are stunned! Evin Lewis brings up his half century in just 18 balls with a quick single off Shakib Al Hasan. What an innings! Mehidy Hasan has been dropped! Big, big chance for Bangladesh to get some control back in the match - but they have just wasted it away. Hasan moves to 49 runs in 17 balls. A change in attack from Bangladesh - Mehidy Hasan replaces Mohammad Saifuddin. And Shai Hope smacks him for a boundary first ball. Welcome Hasan! 50 up for Windies. SIX! SIX! Evin Lewis goes after Hider. First delivery of the second over and he has just smashed his bat. The ball travel miles straight into the crowd. He follows it up with another one. Deja vu! Solid start from Lewis and he has hit the meter running from the get go. Hider punished with two consecutive boundaries in the first over. After 1st over - WI 12/0. Mohammad Saifuddin out on the other end. Evin Lewis out to open with Shai Hope for Windies. Bangladesh hand the new ball to Abu Hider. HERE WE GO! Tino Mawoyo: "It's the same pitch. We won't get as many runs today as we had during the second T20I. It's a tired pitch. It will be slower and will turn due to the dryness." Tamim Iqbal: "If we can beat West Indies today, it will be a great achievement. We played extremely good cricket across all formats. 2015 was the year when I started to think about Fitness. I learnt that fitness will help you score more runs. I didn't play for three months and I was a bit nervous when I came to play the ODIs. Today is a new game and I hope I can contribute." Bangladesh have won the bat flip... err... coin toss, rather, and elected to bowl first! Hello and welcome to our Live blog on Bangladesh vs West Indies 3rd T20I. This series has turned its heads with both the teams with a win each. The hosts would not want to lose another T20I series at home, and the West Indies would be eager to estbalish themselves a fighting unit in limited overs cricket by registering an away series win. Bangladesh vs West Indies 3rd T20 Highlights: Bangladesh lose to West Indies.